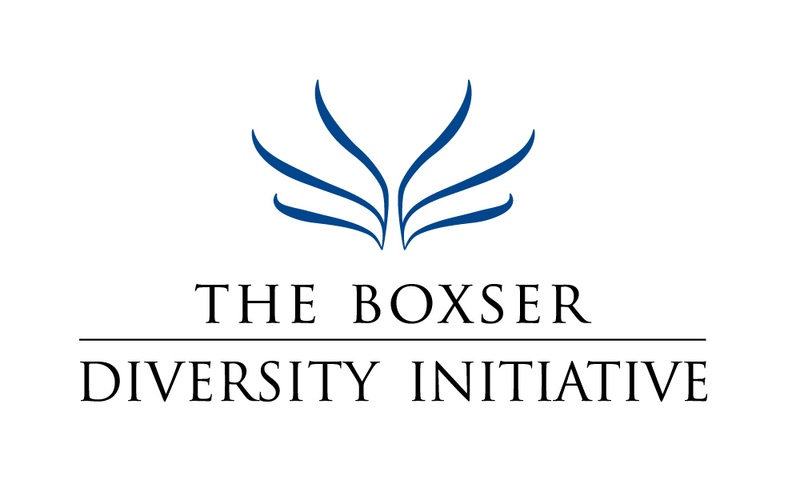 On Friday, April 7, 2017 The Boxser Diversity Initiative and Project 180 present reentry expert Janeen Buck Willison, MSJ of the Urban Institute, Washington, DC. Ms. Buck Willison will discuss the social and psychological effects of imprisonment and how those effects can impact the reentry experience. 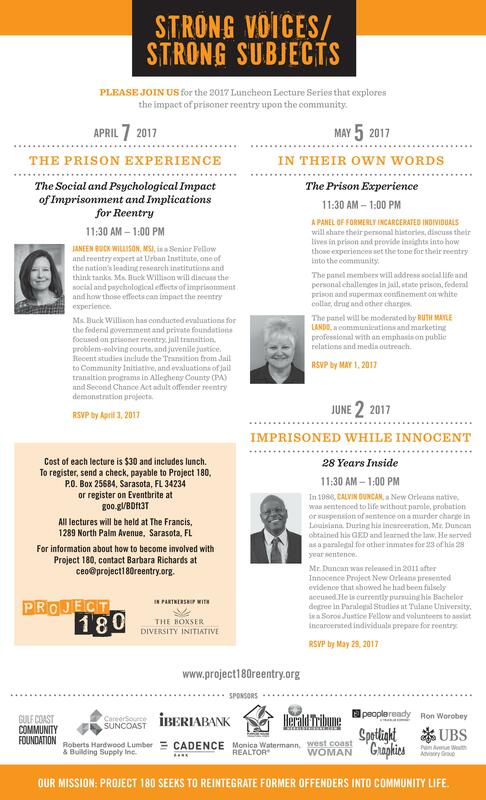 Ms. Buck Willison’s address launches Project 180’s Strong Voices lecture series on “The Prison Experience” to be held on April 7, May 5 and June 2. Each luncheon begins at 11:30 a.m. at The Francis in Sarasota. 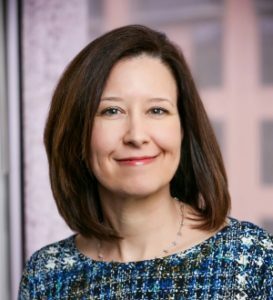 As a Senior Fellow at the Urban Institute, one of the nation’s leading research institutions and think tanks, Ms. Buck Willison has extensive experience in managing and directing multisite studies for the federal government and private foundations on prisoner reentry, juvenile justice reform, delinquency prevention, mental health interventions for offenders, faith-based reentry programs and systems change. Ms. Buck Willison’s most recent studies include the Transition from Jail to Community Initiative (TJC), evaluations of jail transition programs in Allegheny County, PA and Second Chance Act adult offender reentry demonstration projects. Notably, she has also evaluated problem-solving courts including the first national evaluation of teen courts. Attorney Adam Tebrugge, who will participate in the second Strong Voices presentation on May 5th, writes, “Although imprisonment is intended as a punishment that is bounded by time, the effects of imprisonment can linger far longer than one’s sentence. The effects of imprisonment can also have a long-lasting impact upon the community in terms of homelessness, unemployment and familial instability when the prison experience negatively alters one’s ability to successfully reintegrate into his or her community. On May 5th, a panel of former offenders will share their personal histories, discuss their lives in prison and provide insights into how those experiences set the tone for their reentry into the community. On June 2nd, Calvin Duncan will discuss his 28-year incarceration in the Louisiana system. Mr. Duncan was released when Innocence Project New Orleans presented evidence he had been falsely accused. Tickets are $30 per lecture and include lunch. Secure tickets at goo.gl/BDft3T. For sponsorships or more information contact Tracy Pratt, tracy@tracyprattlaw.com or Barbara Richards at ceo@project180reentry.org or 941-677-2281. The Boxser Diversity Initiative (www.boxserdiversityinitiative.org), a 501(c)(3) Sarasota-based nonprofit, promotes diversity programs throughout Southwest Florida including partnering with like-minded organizations in the presentation of speakers and programs promoting diversity and inclusion. Project 180 (www.project180reentry.org), a Sarasota-based 501(c)(3) nonprofit, is a prisoner reentry program. Project 180 seeks to reintegrate former offenders into community life by providing practical educational programs in Gulf Coast prisons and jails and, for the public, Strong Voices, an annual lecture series on prisoner reentry.